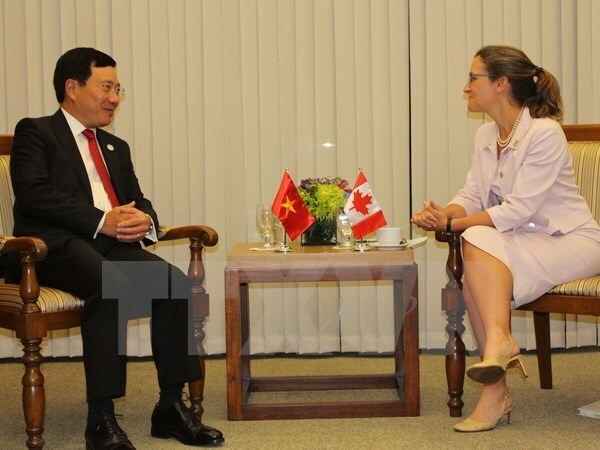 Canada’s Minister of Foreign Affairs Chrystia Freeland made the affirmation at a meeting with Vietnam’s Foreign Minister Pham Binh Minh within the framework of the 50th ASEAN Foreign Ministers’ Meeting in Manila, the Philippines on August 6. The two sides agreed to elevate the bilateral cooperation framework to a new height. While discussing regional and global issues, the ministers affirmed the central role of ASEAN in the region and agreed to maintain ASEAN’s principles of addressing regional disputes peacefully in line with international law, including the 1982 UN Convention on the Law of the Sea, and the Declaration on the Conduct of Parties in the East Sea. They urged ASEAN and China to soon conduct pragmatic negotiations to reach a Code of Conduct in the East Sea. Canada hoped to increase its involvement in the regional architecture and to work with Vietnam and other countries in the Trans-Pacific Partnership agreement to discuss the trade deal’s future. Freeland said Canadian Prime Minister Justin Trudeau is expected to attend the ASEAN Economic Leaders’ Meeting held in Vietnam’s central coastal city of Da Nang in November 2017.